Illus. in full color. "Children feel neglected when parents are preoccupied with other concerns, and young Hannah is no exception. But Hannah has an imaginative outlet--she adores gorillas. On the eve of her birthday, a toy gorilla magically comes to life, and together the two swing through the trees to the zoo. An exuberant story of a lonely girl and a winsome ape." --(starred) School Library Journal. 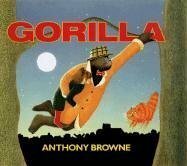 "Browne has created a picture book that explores real emotions with a beautifully realized child protagonist." --(starred) Horn Book.